Are You Ready for a LOVE RESET? Have you had a “Moment of Truth” when you admitted to yourself that your love life just isn’t working right now? Has your man disappointed you one too many times? Has your mother or best friend been hinting (or flat out telling you) that you could do better? Are you tired of everyone else around you getting engaged and “moving on with their life”? Fortunately, this book has answers for you. Some of them may make immediate sense, while others may require some time to sink in. Regardless, I wrote this book to offer some solutions. So if what you’ve been doing isn’t working, how about trying something else? It may be the right time for your LOVE RESET! on the “Thank You” page after purchase. You believe that you have to hear from THIS man – or else! My name is Carla Lynne Hall. I have been a researcher of love, attraction, seduction, and relationships for over 30 years. I believe I’m uniquely qualified to talk about the art and science of romantic attraction because I have made it my mission to study and understand how men and women are attracted to each other. 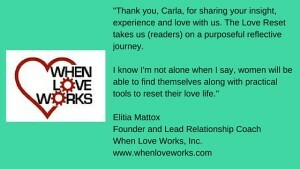 As of this writing, I have interviewed and coached thousands of women about relationships for over 10 years. Over my time in both the “field” (helping women with their relationship issues) and in the laboratory (studying the most recent and relevant psychology studies), I began to see an underlying pattern in the man/woman mating dance. I started to understand what works – and what doesn’t – when it comes to male/female relationship dynamics. Most recently, I am a group moderator for Katarina Phang’s Secret Feminine Magnetism Group on Facebook, in which I’ve been a member for over 3 years. I joined after purchasing her book He’s Really That Into You, He’s Just Not Ready. So yes, I’m not just a moderator, I’m a member, there to improve my own relationships as well. As a group moderator for this hyperactive dating and relationship forum, I have a unique perspective about relationships after witnessing all kinds of breakdowns and breakthroughs in this 5000+ member group over the years. On a personal level, I have also enjoyed real-life romantic experience of my own, having been married, divorced, and enjoyed my share of boyfriends, live-in lovers, and all kinds of relationships in between. I come from a long line of naturally seductive women with much experience attracting men long into old age, and the only times that we are without a mate are when have made the decision to be alone. Having said all of that, I’m the first to admit that I’ve had my share of man troubles too, which also feeds my desire to learn. So I guess you could call me a lay expert (pun intended). We often learn through example, so I’ve included real-life case studies of women who have demonstrated the principles of attraction through their breakthroughs (as well as their breakdowns). Their names have been changed to respect their privacy, and I am grateful that they have allowed me to share their stories. You may also see yourself in some of these stories, and realize that we are all more alike than we are different. It is my hope that their success stories will inspire your own. Reflecting on my years of experience and study, I’ve learned that while each person is unique in their own desires, habits, and romantic styles, certain patterns of human behavior exist. I saw things that women did that drew men to them like bees to honey. And, most importantly, I saw things that you (the woman) can do to shift your energy so that you are once again in “attraction mode”. 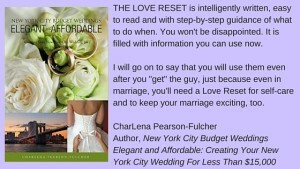 What The Love Professionals Are Saying About The Love Reset ! I had originally started writing this book on January 2, 2015, but I got stuck a couple of times over the course of the year. As one of the group moderators of Katarina Phang’s dating forum (Katarina is the author of He’s Really Into You, He’s Just Not Ready), I wanted to make sure that my work didn’t infringe upon hers. Another time I got stalled when I first became a dating blogger, and had to “come out” publically. And even after I started blogging on my new blog at DatingRelating.com, I still wasn’t sure of the book’s direction. But during the month of December 2015, something interesting happened. In the Fall of 2015, I had blogged about Cuffing Season, the time of the year when singles like to do a lot of indoor dating. You know, it’s cold outside, and you just want to have an indoor boo to have unlimited “Netflix and Chill” nights while it’s cold outside. I had also blogged about the rules about hooking up with someone during Cuffing Season, and not let the “cuddle hormone” Oxytocin blind them to a possible farewell with your indoor boo once the weather starts to get warm again (“Break Up Season” starts around St. Patrick’s Day). I had also written briefly that Cuffing Season also included long-term couples getting engaged at that time. I had even quoted CharLena Peason Fulcher, author of New York City Budget Weddings: Elegant and Affordable: Creating Your NYC Wedding for Less Than $15,000 saying that most engagements happen during Cuffing Season, which is Thanksgiving through Valentine’s Day. So I like to think that I knew that engagements would be announced. What I wasn’t prepared for, though, was the effect of the engagement announcements on the women on the other women in the group. The group had hit some kind of critical mass this year, and engagements were happening almost weekly. One woman even got engaged twice to two different men. Something in the group had shifted, and success stories were plentiful. At the same time, there were a lot of breakups happening. And a lot of women who were in “complicated” relationships, sometimes called “situationships” were feeling mighty triggered by the good news. “Carla, my experience with you has been amazing! Thanks to you, I’ve learned so much, and I will take that knowledge with me.” – Marissa Z. For “Cuffing Season” of 2015, Kat’s group saw 7 engagements in November, and 9 engagements in December. This totaled a whopping 49 wedding proposals in one year in our group of 2800+ women. At the time, I was actively focusing on my other blog, How to Write Blogs for Money. I was “leaning back” from the dating group, but in observation mode in case a situation needed my attention. But since the group notifications were coming through at a hyperactive rate, I was aware of the intense levels of emotion being expressed. I even remember thinking, “I wish these ladies could calm down a bit so I can come up with an idea for a product!” Ha! Now that Katarina’s group had my full attention again, I realized that there was a distinct PATTERN at work – one that I’ve experienced and witnessed hundreds of times! I just never had a name for it!!! 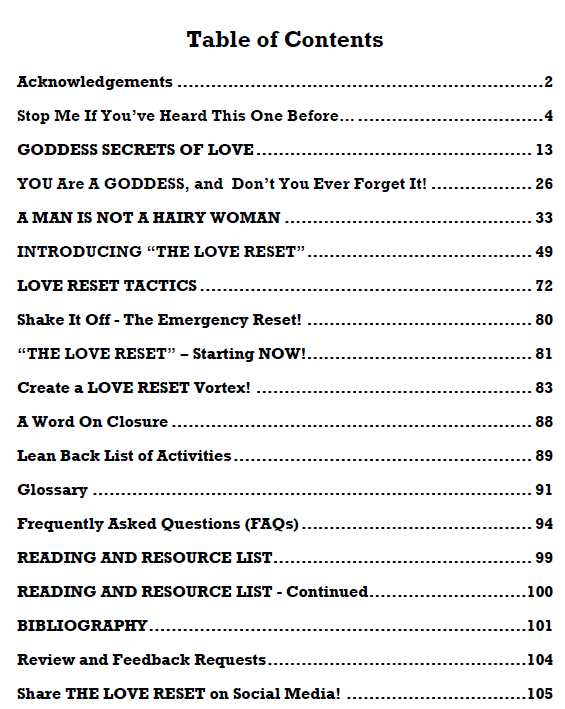 In the women who found committed relationships after being in the group, I discovered the “method to the madness”, and named it “The Love Reset”. It felt like the missing piece of the puzzle for my book. I was so stoked I immediately wrote TWO guest articles on Kat’s “Man Whisperer” Blog. While an engagement ring might not sound like much to some, for me, each engagement ring symbolizes a woman’s TRANSFORMATION. As I like to say, “Only when you’ve seen the BEFORE, can you fully appreciate the AFTER”. Most women join the group because they are anxious about a particular man. So a woman’s engagement means that the woman has learned how to re-focus on her own well-being, which prepared her for the relationship that she is seeking. In other words, each transformed woman had a LOVE RESET. 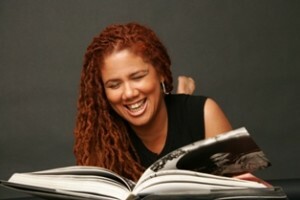 “Carla, thank you so much for your ideas, inspiration and positive energy – and inspiring us to ‘Bring it! '”- Cady F.
“Carla, I really learned a lot from our discussions and your vast knowledge. 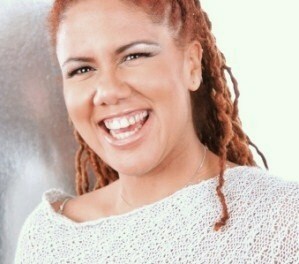 I’m thankful for your continued encouragement and support.” – Suzanne C.
Are YOU Ready For A LOVE RESET??? From time to time, we all need a reset to find our groove again. 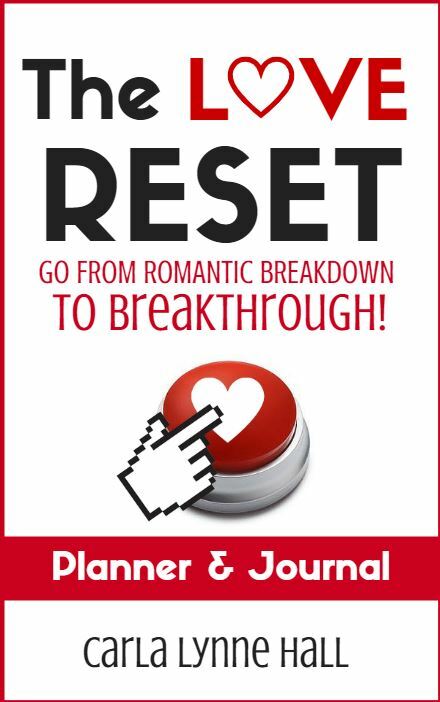 I’ve had a healthy share of difficulties and challenges in my life, and I’m proud to call myself “The Reset Queen”. 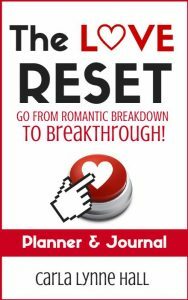 My eBook is about helping women “reset” themselves, so they can have they want: a fulfilling romantic relationship. This book owes a huge debt of gratitude to my colleague and mentor Katarina Phang and her Feminine Magnetism coaching group of over 2900 from women all over the world. As I consider myself more of a “Love Researcher”, than a love coach, I have benefited from being a member and moderator of this online group. For one thing, it is totally fascinating to learn firsthand how women of numerous nationalities and cultures behave in their relationships (again – we are more alike than we are different)! I was joined this group on Facebook after purchasing her fascinating eBook, He’s That Into You, He’s Just Not Ready. This group has been a wonderful real-life laboratory of women who have made significant breakthroughs in their love lives, and I continue to learn from them every day. When I was 11, I read my first self-help book, How to Win Friends and Influence People by Dale Carnegie. And I’ll be honest, the main reason I even checked out that book from my junior high school library was because I wanted to meet boys. I learned quickly that for just about every relationship situation, someone has written a book about it. In other words, the instruction manual that you’ve been seeking exists! My book is all about how to be a feminine magnet. If you’re ready for real love, let’s get started!